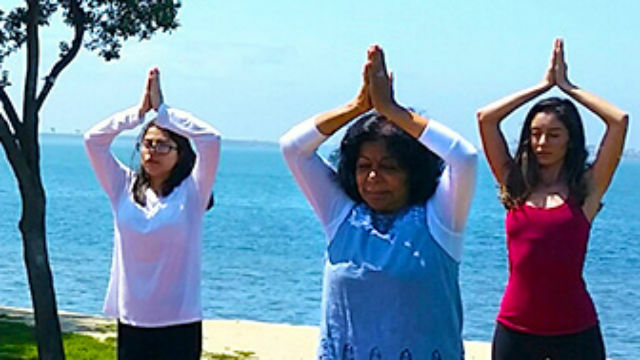 Yoga classes by the bay will be part of South Bay Earth Day. Environmentally conscious San Diegans — from bicyclists to artists to organic foodies — are looking forward to South Bay Earth Day, which takes place Saturday, April 7, at Chula Vista’s Bayside Park. The free event from 11 a.m. to 4 p.m. features more than 40 green vendors, an “artist alley” with environmental art, pop-up musical performances, yoga classes, electric-vehicle test drives, a farmers market and lots of healthy food. Guests are encouraged to ride their bicycles to the park, where a bike valet will be on hand to park and watch over your ride. A series of zero-waste workshops are planned, including how to make T-shirt produce bags, package-free granola balls, do-it-yourself toothpaste and soap-nut cleanser. A “fix-it” clinic will show you how to fix electronics, appliances, computers and more instead of throwing them out. For fun there’s a tie dye workshop — bring your light-colored shirts, shorts and socks — and games for the kids. Some of San Diego County’s most popular organic and healthy food trucks will be at the event to make sure no one goes hungry while learning how to save the planet. The event is sponsored by I Love a Clean San Diego and the City of Chula Vista. Volunteers are welcome and can register online.